Wynyard Woods in the heart of the Tees Valley is located on the old Wynyard Estate, which was formerly the home of Lord and Lady Londonderry. 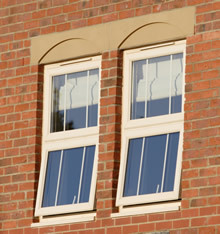 Set in mature woodland, Bellway Homes was keen to retain the heritage of the site and choose Sheerframe PVC windows from H Jarvis using white, cream and mahogany coloured profile and Pilkington Activ™ self-cleaning glass. The use of PVC coloured frames helped Bellway to achieve a look and style that would satisfy local planners, who had previously specified timber framed windows, and meet the requirement for long term performance and maintenance-free living by discerning house buyers. Pilkington Activ™ self-cleaning glass is environmentally friendly and easy to maintain and is designed to save house buyers time and money. Located close to the Wellington champion standard golf course the large detached properties at Wynyard Woods were designed sympathetically to reflect the exclusive nature of the village and proved extremely popular with house buyers. Bellway also achieved two NHBC Pride in the Job awards for their high quality work at Wynyard Woods.